Luka Doncic has taken his talents to the NBA but the 2018-19 EuroLeague season promises to be an exciting one. With five different champions the last six seasons the league again feels up for grabs. Let’s get in to our three favorite picks – as listed by Karamba – and a favorite dark horse for fans of basketball betting to consider. A 24-6 regular season was erased in a flash by Luka Doncic in the semifinals of the Final Four, with the top seed falling before the championship game. This group will be looking for redemption and will have a good shot at it by bringing back four players who ranked in the top-10 in Performance Index Rating (PIR) last season. It begins with Nando de Colo, who ranked third in points (16.6), fifth in 3-point field goal percentage (49.2%) and sixth in steals (1.25). The 2016 EuroLeague Final Four MVP and champion will have CSKA in contention, along with point guard Sergio Rodriguez, Cory Higgins and Will Clyburn. They also shored up the center position by adding a pair of former NBAers in Joel Bolomboy and Alec Peters. Head coach Dimitrios Itoudis has a career record of 103-27 in four EuroLeague seasons with CSKA, including the 2016 title. As long as de Colo is healthy they’ll have a good shot at earning the top seed once again, so it’s no surprise that they’re the favorites on Karamba at +225. Željko Obradović has transformed Fenerbahçe from a team that had been to the postseason once in its first seven seasons to an annual participant in the Final Four. Fenerbahçe are one of four teams since 2000 to make three consecutive EuroLeague Finals (Real Madrid, 2013-15; CSKA Moscow 2006-09; Maccabi Elite Tel Aviv, 2003-05), including a 2017 championship under Obradović, who has won a whopping nine EuroLeague titles. Jan Veseley was 7th in PIR and point guard Kostas Sloukas finished 7th in assists per game (5.4). Fenerbahçe finished second in 3-point field goal percentage led by the likes of Sloukas, James Nunnally and Luigi Datome. Nunnally signed the with the NBA’s Minnesota Timberwolves over the summer but the other two are back. Fenerbahçe, like CSKA Moscow, dipped into the NBA waters. They signed point guard Tyler Ennis – 54 games with the Los Angeles Lakers last season – and versatile forward Joffrey Lauvergne – 55 games with the Spurs last season – that should add to their solid depth and balance. Obradović gets it done year in and year out, meaning they’ll be there near the season’s end. They’re our favorite odds at +350 on Karamba. What’s the best way to bounce back from losing the EuroLeague MVP? Replace him with another. That’s what Real Madrid will do in 2018-19. Luka Doncic was the league’s best player a year ago before the Dallas Mavericks made him the third pick of the 2018 NBA Draft. The good news is they’ll get back a healthy Sergio Llull, the 2017 EuroLeague MVP who was limited to just four games last year while recovering from ACL rehab. If Llull regains his form from 2017, when he was 7th in PIR, 4th in points, 1st in 3-pointers and 7th in assists then Real Madrid has a legitimate shot. 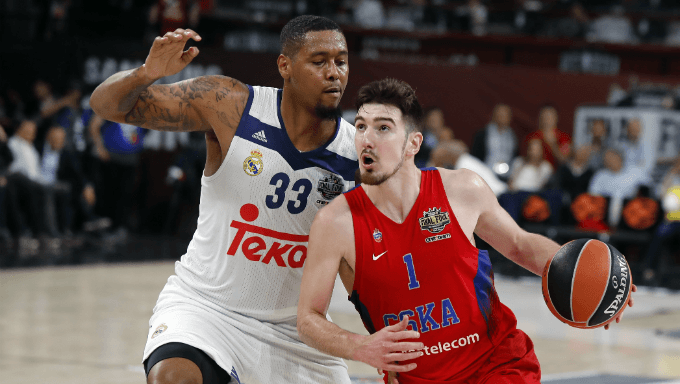 Veteran Rudy Fernandez will loom large once again and take on an even larger role without Doncic, while the inside trio of Trey Thompkins, Gustavo Ayon and Walter Tavares patrol the paint. There may be an adjustment period with Doncic gone, but there’s boatloads of talent for a team that has +450 odds on Karamba. No EuroLeague team underwent a bigger transformation than Maccabi. Seven new faces will take the floor for head coach Neven Spahija, including former University of Florida guard and 7DAYS EuroCup MVP Scottie Wilbekin. He’ll join another newcomer in Jeremy Pargo and a pair of former NBA bigs in Tarik Black and Johnny O’Bryant. Toss in the returning DeAndre Kane and you have a team that could make some noise after they showed some potential the last few years. If all the pieces come together – and Wilbekin takes another step – they’ll be well worth the +3300 odds on Karamba.